Music groups, singing and fun for babies, toddlers and pre-school children with their parents and carers in Kings Hill & Malling! 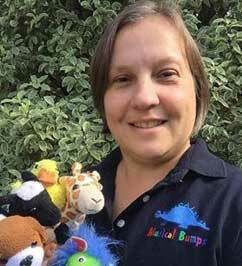 I’m Helen and I run Musical Bumps classes in the Kings Hill and Malling area. Hello, I’m Helen and I am excited to be delivering Musical Bumps classes in Kings Hill! As a child, I learnt to play the piano and was a member of the school madrigal choir. My interest in music was reignited when I joined Musical Bumps classes as a parent where I enjoyed learning new songs and made new friends. I also bonded well with the teacher so when, in September 2012, she informed me of the chance to become a teacher myself, I snapped up the opportunity to begin teaching Musical Bumps to children at my local nursery. Since then I have taught many classes all over Kent but am thrilled to now have my own Musical Bumps business. Do get in touch if you’d like to come along for a free taster. We’d love to meet you. Please contact me with your mobile number and your child’s name and age for more information or to book a free trial class, giving the day you would like to come along helen.daniels@musicalbumps.com 07927 554 819. We have lots of fun at Musical Bumps on Friday at Nursery on the Hill. You can phone us on 07927 554 819 or complete this form to book your free trial class. In order to comply with the new General Data Protection Regulation (GDPR, May 2018), please complete and submit this Registration and Permissions Form. To comply with Musical Bumps safeguarding policies, we need to receive the completed registration form for each child before enrolment and prior to attending your first paid class. We currently deliver weekly sessions at Nursery on the Hill in Kings Hill and are always keen to speak to other nurseries, pre-schools and schools about delivering a bespoke programme of learning for your school or nursery’s specific needs. From one-off workshops or parties, clubs and choirs right through to a full music curriculum for EYFS and KS1, you can rely on Musical Bumps to provide stimulating, ambitious, practical and musical classes and clubs! Kings Hill Community Centre, 70 Gibson Drive, Kings Hill, West Malling, Kent, ME19 4LG. Free parking.